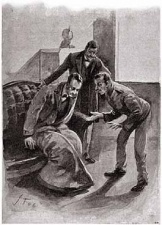 The Adventure of the Blue Carbuncle (BLUE) is a short story written by Arthur Conan Doyle first published in The Strand Magazine in january 1892. This is the 9th Sherlock Holmes story. Collected in The Adventures of Sherlock Holmes. in The Courier-Journal, Louisville (9 january 1892 [US]) 1 ill.
in The Examiner, San Francisco (14 february 1892 [US]) 3 ill. The roughs had fled at the appearance of Peterson. I saw a tall man in a scotch bonnet, with a coat which was buttoned up to the chin. Ryder threw himself down suddenly and clutched at my companion's knees. He was left in possession of the field of battle. See here, Sir! See what my wife found in its crop! 'Mr. Henry Baker, I believe,' said he. 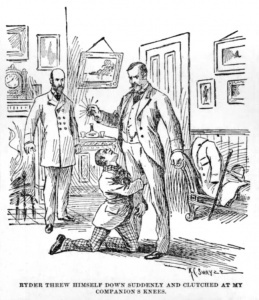 'Oh, Sir, you are the very man whom I have longed to meet,' cried the little fellow. What a shrimp it is, to be sure! He burst into convulsive sobbing, with his face buried in his hands. 1984 : The Blue Carbuncle (UK). Holmes : Jeremy Brett. Watson : David Burke. 1979 : Голубой Карбункул (RU). 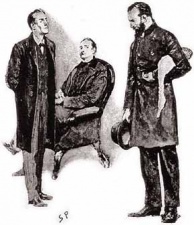 Holmes : Algimantas Masiulis. Watson : Ernst Romanov. 1968 : The Blue Carbuncle (UK). Holmes : Peter Cushing. Watson : Nigel Stock. 1923 : The Blue Carbuncle (UK). Holmes : Eille Norwood. Watson : Hubert Willis. 2008 : The Blue Carbuncle. Holmes : John Patrick Lowrie. Watson : Lawrence Albert. 1991 : The Blue Carbuncle. Holmes : Clive Merrison. Watson : Michael Williams. 1978 : The Blue Carbuncle. Holmes : Barry Foster. Watson : David Buck. 1961 : The Blue Carbuncle. Holmes : Carleton Hobbs. Watson : Norman Shelley. 1957 : The Blue Carbuncle. Holmes : Carleton Hobbs. Watson : Norman Shelley. 1955 : The Adventure of the Blue Carbuncle. Holmes : John Gielgud. Watson : Ralph Richardson. 1954 : The Adventure of the Blue Carbuncle. Holmes : John Gielgud. Watson : Ralph Richardson. 1952 : The Blue Carbuncle. Holmes : Carleton Hobbs. Watson : Norman Shelley. 1948 : The Adventure of the Blue Carbuncle. Holmes : John Stanley. Watson : Wendel Holmes. 1944 : The Blue Carbuncle. Holmes : Basil Rathbone. Watson : Nigel Bruce. 1940 : The Blue Carbuncle. Holmes : Basil Rathbone. Watson : Nigel Bruce. 1932 : The Adventure of the Blue Carbuncle. Holmes : Richard Gordon. Watson : Leigh Lovell. 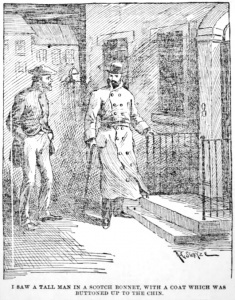 While going home, Peterson, the commissionaire, is witnessing a fight between a man and thugs. 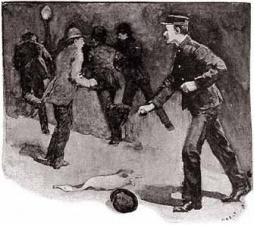 In the fight, the man looses his hat and a goose. At the sight of the uniform of Peterson, everyone flee, leaving the hat and goose on the floor. 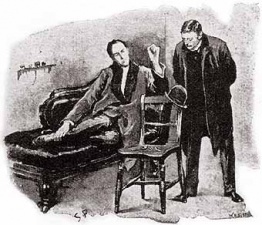 Holmes advises him to eat the goose and give him the hat, from which he deduces that he belongs to a Mr. Henry Baker. While cooking the goose, Peterson's wife discovers a priceless gem in the crop of the bird. The very stone stolen from the Countess of Morcar a few days ago at the Cosmopolitan Hotel. John Horner, a plumber who was working at the hotel, was accused of the theft and arrested on the testimony of James Ryder, the chief of staff. Holmes publishes an ad in the newspapers to find Mr. Henry Baker. He successes to trace back the history of the goose until the provider and finds James Ryder, the real thief of the stone. He lets Ryder leave the country but Horner could be released because the lack of evidence. The carbuncle is returned to the Countess and Peterson receives a reward of £1,000. 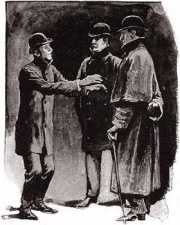 I had called upon my friend Sherlock Holmes upon the second morning after Christmas, with the intention of wishing him the compliments of the season. He was lounging upon the sofa in a purple dressinggown, a pipe-rack within his reach upon the right, and a pile of crumpled morning papers, evidently newly studied, near at hand. Beside the couch was a wooden chair, and on the angle of the back hung a very seedy and disreputable hard felt hat, much the worse for wear, and cracked in several places. A lens and a forceps lying upon the seat of the chair suggested that the hat had been suspended in this manner for the purpose of examination. I took the tattered object in my hands, and turned it over rather ruefully. It was a very ordinary black hat of the usual round shape, hard and much the worse for wear. The lining had been of red silk, but was a good deal discoloured. There was no maker's name; but, as Holmes had remarked, the initials 'H. B.' were scrawled upon one side. It was pierced in the brim for a hat-securer, but the elastic was missing. For the rest, it was cracked, exceedingly dusty, and spotted in several places, although there seemed to have been some attempt to hide the discoloured patches by smearing them with ink. 'I can see nothing,' said I, handing it back to my friend. 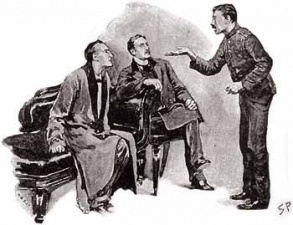 Sherlock Holmes had opened his mouth to reply, when the door flew open, and Peterson the commissionaire rushed into the compartment with flushed cheeks and the face of a man who is dazed with astonishment. 'The goose, Mr. Holmes! The goose, sir!' he gasped. 'Eh! What of it, then? Has it returned to life, and flapped off through the kitchen window?' 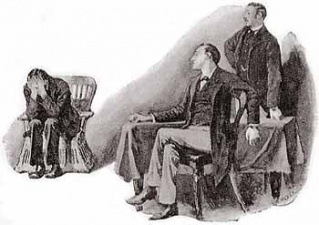 Holmes twisted himself round upon the sofa to get a fairer view of the man's excited face. 'See here, sir! See what my wife found in its crop!' He held out his hand, and displayed upon the centre of the palm a brilliantly scintillating blue stone, rather smaller than a bean in size, but of such purity and radiance that it twinkled like an electric point in the dark hollow of his hand. 'Not the Countess of Morcar's blue carbuncle?' I ejaculated. 'A thousand pounds! Great Lord of mercy!' The commissionaire plumped down into a chair, and stared from one to the other of us. 'It was lost, if I remember aright, at the Hotel Cosmopolitan,' I remarked. 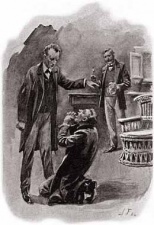 When the commissionaire had gone, Holmes took up the stone and held it against the light. 'It's a bonny thing,' said he. 'Just see how it glints and sparkles. Of course it is a nucleus and focus of crime. Every good stone is. They are the devil's pet baits. In the larger and older jewels every facet may stand for a bloody deed. This stone is not yet twenty years old. It was found in the banks of the Amoy River in Southern China, and is remarkable in having every characteristic of the carbuncle, save that it is blue in shade, instead of ruby red. In spite of its youth, it has already a sinister history. There have been two murders, a vitriol-throwing, a suicide, and several robberies brought about for the sake of this forty-grain weight of crystallized charcoal. Who would think that so pretty a toy would be a purveyor to the gallows and the prison? I'll lock it up in my strong-box now, and drop a line to the Countess to say that we have it! 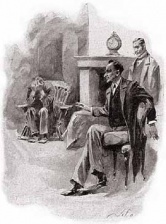 I had been delayed at a case, and it was a little after half-past six when I found myself in Baker Street once more. As I approached the house I saw a tall man in a Scotch bonnet, with a coat which was buttoned up to his chin, waiting outside in the bright semicircle which was thrown from the fanlight. 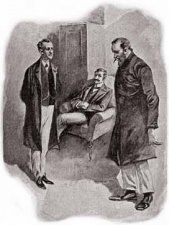 Just as I arrived, the door was opened, and we were shown up together to Holmes's room. 'Yes, sir, that is undoubtedly my hat.' He was a large man, with rounded shoulders, a massive head, and a broad, intelligent face, sloping down to a pointed beard of grizzled brown. A touch of red in nose and cheeks, with a slight tremor of his extended hand, recalled Holmes's surmise as to his habits. His rusty black frock-coat was buttoned right up in front, with the collar turned up, and his lank wrists protruded from his sleeves without a sign of cuff or shirt. He spoke in a low staccato fashion, choosing his words with care, and gave the impression generally of a man of learning and letters who had had ill-usage at the hands of fortune. 'To eat it!' Our visitor half rose from his chair in his excitement. 'Oh, certainly, certainly!' answered Mr. Baker, with a sigh of relief. Sherlock Holmes glanced across at me with a slight shrug of his shoulders. 'Certainly, sir,' said Baker, who had risen and tucked his newly gained property under his arm. 'There are a few of us who frequent the Alpha Inn near the Museum - we are to be found in the Museum itself during the day, you understand. This year our good host, Windigate by name, instituted a goose-club, by which, on consideration of some few pence every week, we were to receive a bird at Christmas. My pence were duly paid, and the rest is familiar to you. I am much indebted to you, sir, for a Scotch bonnet is fitted neither to my years nor my gravity.' 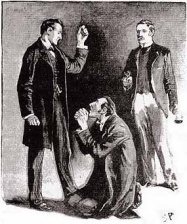 With a comical pomposity of manner he bowed solemnly to both of us, and strode off upon his way. It was a bitter night, so we drew on our ulsters and wrapped cravats about our throats. Outside, the stars were shining coldly in a cloudless sky, and the breath of the passers-by blew out into smoke like so many pistol shots. Our footfalls rang out crisply and loudly as we swung through the doctors' quarter, Wimpole Street, Harley Street, and so through Wigmore Street into Oxford Street. In a quarter of an hour we were in Bloomsbury at the Alpha Inn, which is a small publichouse at the corner of one of the streets which run down into Holborn. 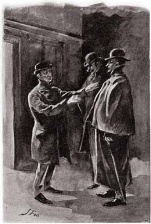 Holmes pushed open the door of the private bar, and ordered two glasses of beer from the ruddy-faced, white-aproned landlord. 'Your beer should be excellent if it is as good as your geese,' he said. 'My geese!' The man seemed surprised. We passed across Holborn, down Endell Street, and so through a zigzag of slums to Covent Garden Market. One of the largest stalls bore the name of Breckinridge upon it, and the proprietor, a horsy-looking man, with a sharp face and trim side-whiskers, was helping a boy to put up the shutters. 'Good evening. It's a cold night,' said Holmes. 'Sold out of geese, I see,' continued Holmes, pointing at the bare slabs of marble. 'Warm! You'd be as warm, maybe, if you were as pestered as I am. When I pay good money for a good article there should be an end to the business; but it's "Where are the geese?" and "Who did you sell the geese to?" and "What will you take for the geese?". 'Well, then, you've lost your fiver, for it's town bred,' snapped the salesman. The salesman chuckled grimly. 'Bring me the books, Bill,' said he. 'Mrs. Oakshott, 117 Brixton Road - 249,' read Holmes. 'No: but one of them was mine all the same,' whined the little man. 'Well, you can ask the King of Proosia, for all I care. I've had enough of it. Get out of this!' He rushed fiercely forward, and the inquirer flitted away into the darkness. 'Ha, this may save us a visit to Brixton Road,' whispered Holmes. 'Come with me, and we will see what is to be made of this fellow.' Striding through the scattered knots of people who lounged round the flaring stalls, my companion speedily overtook the little man and touched him upon the shoulder. He sprang round, and I could see in the gaslight that every vestige of colour had been driven from his face. 'Who are you, then? What do you want?' he asked in a quavering voice. The man hesitated for an instant. 'My name is John Robinson,' he answered, with a sidelong glance. The little man stood glancing from one to the other of us with half-frightened, half-hopeful eyes, as one who is not sure whether he is on the verge of a windfall or of a catastrophe. Then he stepped into the cab, and in half an hour we were back in the sitting-room at Baker Street. Nothing had been said during our drive, but the high, thin breathings of our new companion, and the claspings and unclaspings of his hands, spoke of the nervous tension within him. Our visitor staggered to his feet, and clutched the mantelpiece with his right hand. 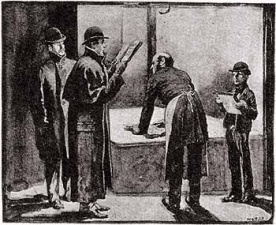 Holmes unlocked his strong-box, and held up the blue carbuncle, which shone out like a star, with a cold, brilliant, manypointed radiance. Ryder stood glaring with a drawn face, uncertain whether to claim or to disown it. 'It was Catherine Cusack who told me of it,' said he, in a crackling voice. Ryder passed his tongue over his parched lips. 'I will tell you it just as it happened, sir,' said he. 'When Horner had been arrested, it seemed to me that it would be best for me to get away with the stone at once, for I did not know at what moment the police might not take it into their heads to search me and my room. There was no place about the hotel where it would be safe. I went out, as if on some commission, and I made for my sister's house. She had married a man named Oakshott, and lived in Brixton Road, where she fattened fowls for the market. All the way there every man I met seemed to me to be a policeman or a detective, and for all that it was a cold night, the sweat was pouring down my face before I came to the Brixton Road. My sister asked me what was the matter, and why I was so pale; but I told her that I had been upset by the jewel robbery at the hotel. Then I went into the back-yard, and smoked a pipe, and wondered what it would be best to do. 'I had a friend once called Maudsley, who went to the bad, and has just been serving his time in Pentonville. One day he had met me, and fell into talk about the ways of thieves and how they could get rid of what they stole. I knew that he would be true to me, for I knew one or two things about him, so I made up my mind to go right on to Kilburn, where he lived, and take him into my confidence. He would show me how to turn the stone into money. But how to get to him in safety? I thought of the agonies I had gone through in coming from the hotel. I might at any moment be seized and searched, and there would be the stone in my waistcoat pocket. I was leaning against the wall at the time, and looking at the geese which were waddling about round my feet, and suddenly an idea came into my head which showed me how I could beat the best detective that ever lived. 'My sister had told me some weeks before that I might have the pick of her geese for a Christmas present, and I knew that she was always as good as her word. I would take my goose now, and in it I would carry my stone to Kilburn. There was a little shed in the yard, and behind this I drove one of the birds, a fine big one, white, with a barred tail. I caught it and, prising its bill open, I thrust the stone down its throat as far as my finger could reach. The bird gave a gulp, and I felt the stone pass along its gullet and down into its crop. But the creature flapped and struggled, and out came my sister to know what was the matter. As I turned to speak to her the brute broke loose, and fluttered off among the others. '"Whatever were you doing with that bird, Jem?" says she. '"Well," said I, "you said you'd give me one for Christmas, and I was feeling which was the fattest." '"Oh," says she, "we've set yours aside for you. Jem's bird, we call it. It's the big, white one over yonder. There's twenty-six of them, which makes one for you, and one for us, and two dozen for the market." '"Thank you, Maggie," says I; "but if it is all the same to you I'd rather have that one I was handling just now." '"The other is a good three pound heavier," she said, "and we fattened it expressly for you." '"Never mind. I'll have the other, and I'll take it now," said I. '"Oh, just as you like," said she, a little huffed. "Which is it you want, then?" '"That white one, with the barred tail, right in the middle of the flock." '"Oh, very well. Kill it and take it with you." 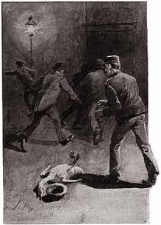 'Well, I did what she said, Mr. Holmes, and I carried the bird all the way to Kilburn. I told my pal what I had done, for he was a man that it was easy to tell a thing like that to. He laughed until he choked, and we got a knife and opened the goose. My heart turned to water, for there was no sign of the stone, and I knew that some terrible mistake had occurred. I left the bird, rushed back to my sister's, and hurried into the back-yard. There was not a bird to be seen there. '"Where are they all, Maggie?" I cried. '"But was there another with a barred tail?" I asked, "the same as the one I chose?" '"Yes, Jem, there were two barred-tailed ones, and I could never tell them apart." 'Well, then, of course, I saw it all, and I ran off as hard as my feet would carry me to this man Breckinridge; but he had sold the lot at once, and not one word would he tell me as to where they had gone. You heard him yourselves to-night. Well, he has always answered me like that. My sister thinks that I am going mad. Sometimes I think that I am myself. And now - and now I am myself a branded thief, without ever having touched the wealth for which I sold my character. God help me! God help me!' He burst into convulsive sobbing, with his face buried in his hands. 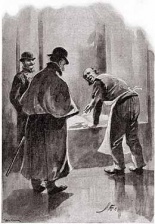 There was a long silence, broken only by his heavy breathing, and by the measured tapping of Sherlock Holmes's finger-tips upon the edge of the table. Then my friend rose, and threw open the door.